Great news if you're a fan of Kunio and happen to be looking to expand your Super Famicom cartridge collection. 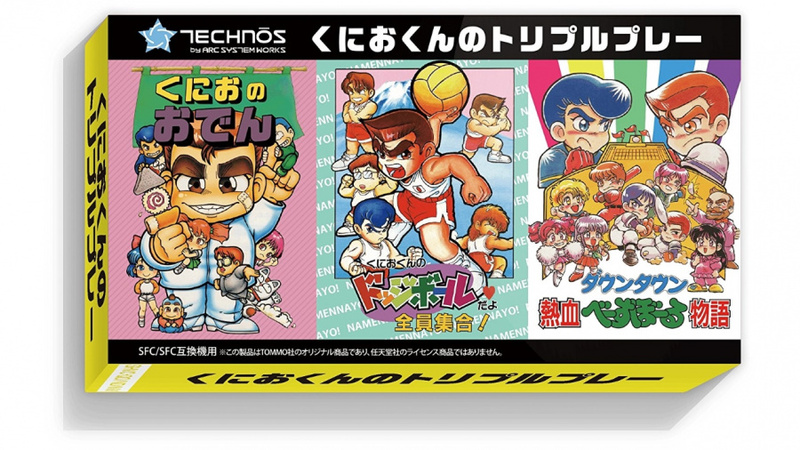 A recent Amazon Japan listing has revealed what can be roughly translated as 'Kunio's Triple Play Replica Package', a complete Super Famicom boxed cartridge that brings together Kunio-kun’s Dodgeball, Downtown Nekketsu Baseball Monogatari and Kunio’s Oden 16-bit spin-off releases. Below is some footage of the baseball title. As you can expect from a Kunio game, rules are rather relaxed in regards to the amount of physical contact on the pitch. Published by Arc System Works (with a new “Technos by Arc System Works” logo displayed in the box, in case people forgot who made Kunio in the first place), this title will be released on the 9th of August, setting you back ￥ 6,458. Are you a fan of Kunio? Did you pick up the latest and greatest Super Nintendo clone hardware and are looking to expand your import collection? Tell us in the comments below. I can't shake the feeling these cartridges they usually release are roms dumpted into cartridges but without any kind of license. For me it's like a repro cartridge, although well presented. Anyway, they're always expensive as hell and are for NTSC consoles. @Moroboshi876 This is an official Arc System Works product so no worries there. @Shiryu No, I wasn't implying these weren't official. What I mean is a cartridge with several games now feels just like a repro, and those I don't like. @Moroboshi876 Ah, I get ya. But its probably still a better deal than getting all three of them individually. @ogo79 Digital only, correct? Wow I'm behind..... 😕 I don't think NintendoLife reviewed it? ogo79 is a manly gamer.